To encourage and reward builders, architects, and home owners to blend newly remodeled or constructed homes and businesses into the fabric of Minneapolis neighborhoods. AND STARTING IN 2018...ST PAUL NEIGHBORHOODS TOO! There is no project too small nor too big to BLEND! Whether it’s an addition, new construction, new/redone outbuilding, landscape project, exterior facelift, or something else – residential or commercial – any project (regardless of cost) can BLEND! Congratulations to 2018 BLEND Award Winners - MINNEAPOLIS & ST PAUL!! Click here for a full list of Minneapolis winners and please visit the 2018 Gallery for more project photos! Click here for a full list of St Paul winners! Check out pictures from the 2018 Celebration, including all the winners! Past BLEND Awards Winners: click here to request a FREE yard sign! For details on the 2018 submission process, including guidelines & forms to assist in preparing for electronic submission, click here. Homeowners - Don't be *that* house! Thanks to all who visited BLEND Awards booth at the 2018 Southwest Home Improvement Fair for tips & resources! Nominate your neighbor! Do you know of a project or property that is BLEND-worthy? Let us know about it! We will send them a postcard and encourage them to submit the project for consideration of a 2018 BLEND Award! See more details here! Interested in sponsorship? Contact dan@blendaward.org for sponsorship information. BLEND Awards is expanding to St. Paul! In partnership with the Macalester-Groveland Community Council, building projects in St. Paul are now eligible to submit for a BLEND Award. There will be a separate judging panel and separate Awards ceremony, but the online submission process & timeline will be the same as BLEND-Minneapolis. Information and online submission will be centralized through the BLEND Awards website, www.blendaward.org. Be sure to sign up for our email list to receive updates & the latest news! Homeowner Outreach. The BLEND Awards is implementing a homeowner outreach effort, including a booth at the SW Home Improvement Fair, a year-long series of ads & features in the Southwest Journal, a new section on our website, and increased social media action. Our goal is help homeowners enhance our neighborhoods with BLEND-worthy projects by providing resources to them. In addition to disseminating BLEND guidelines, our outreach highlights BLEND Award-winning architects & builders! Do you know of a project or property that is BLEND-worthy? Let us know about it! We will send them a postcard and encourage them to submit the project for consideration of a 2017 BLEND Award! See more details here! ​You don't have to have do a whole house re-model, or a new house or spend loads of money to be a BLEND winner! 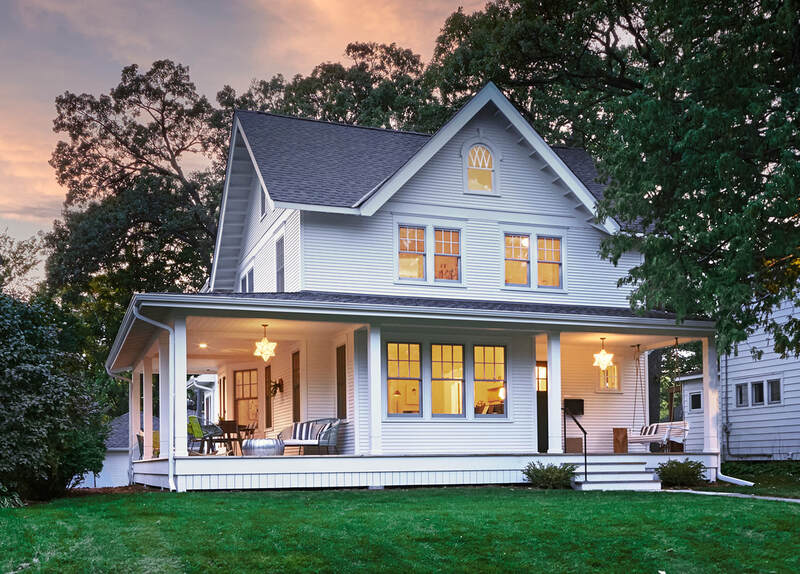 A porch addition, a new entry, and even a garage have received BLEND Awards in the past. In 2017, there will be special emphasis on small projects that improve a property and BLEND with the existing fabric of the neighborhood. Be sure to submit projects of all sizes!! ​A significant portion of BLEND/EcoBLEND submission is ONLINE! In an effort to streamline the submission process, all materials except the display board & submission fee, will be submitted ONLINE this year. (Please bear with us...there are bound to be hiccups in our first year, and we are eager for your feedback.) For details on the updated submission process, click here. New in 2015...and continuing for 2016! The BLEND Award committee is excited to announce two new components to the BLEND Awards! Best in Show - For the first time, one project will be selected by the judges as "Best in Show" of all BLEND Award recipients! The Best in Show winner will be highlighted on the BLEND webpage and in our outreach and press releases. EcoBLEND Badge - The EcoBLEND Badge recognizes projects that incorporate eco-friendly design and sustainable building practices - but at a lower threshold than the full-blown EcoBLEND Award. The EcoBLEND Badge is intended to honor projects that not only represent good neighborhood design, but also go above & beyond building code and general expectations regarding the overall environmental 'footprint' of the project. Click here for more on EcoBLEND badge. Updated BLEND Guidelines - The BLEND Guidelines have been updated and simplified to be more widely applicable city-wide. Check out the updated Guidelines here. The BLEND Award organization recognizes that redevelopment of the residential parts of the neighborhood is both a given and a positive indicator for the neighborhood. Our goals are to 1) ensure that the redevelopment builds upon the qualities that have made Minneapolis a place where people have chosen to live for so many years, 2) ensure redevelopments respect the privacy, light access, private views of neighboring properties and maintain a human scale, and 3) encourage redevelopment and construction of homes that are diverse and innovative in design but still compatible with the neighborhood.